This lovely Copper & Silver Bangle is made predominantly of Copper but has a sterling silver textured band detail at the centre which spins freely. The Bangle is handcrafted by me and made to order, however no two would be the exaclty same due to the handmade nature of the Bangle. However the image shown is a good representation of the Bangle you would receive. The bangle's band is approximately 3.5cm wide and the silver band approximately 5mm wide. The Copper and the silver have been highly polished and then a patina has been added to give the Copper it rich colours. 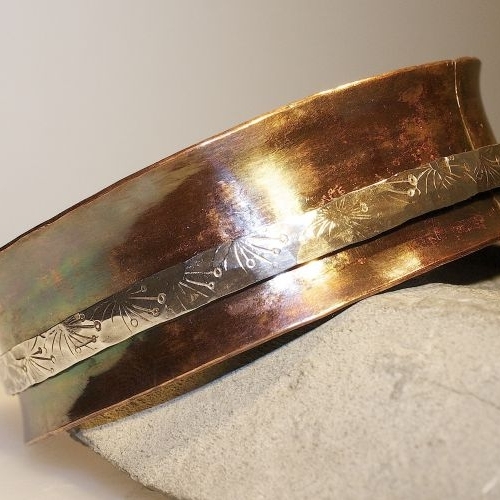 To keep your bangle looking highly polished i recommend poslishing it from time to time with a silver polishing cloth which works great on Copper also. The Bangles size can be made to any size, please use the drop down option to select. Please allow 4-6 days from date of ordering. The Bangle has an anti-clastic curve so is very comfortable to get on and off the wrist and to wear. Copper has a beautiful warm quality and is renowned for its healing ability often worn to alleviate the symptoms of arthritis. Your Wide Copper Sterling Silver Spinner Bangle will be presented in a black gift boxes and posted via 1st class Royal Mail recorded delivery (signed for) to any UK address free of charge.